In our poker rules guide, we’ll first take a look at the basic poker rules and then breakdown the different poker hands at play. Poker may very well be the most popular casino table game.With a ton of varieties of poker games, there come a variety of poker rules. South African players new to the game may feel confused and overwhelmed by the sheer number of poker variations. Relax, take a deep breath, and let’s start from the beginning. We recommend that when it comes to learning poker, it’s important to master how to play basic poker first and basic poker rules before graduating to the big leagues. Let’s take a look at what the fundamental rules to a poker game are. Rule 1: Place a bet into the pool or pot. To start off a game of poker, place your bet into the communal pot. Depending on the casino, the game’s minimum and maximum bet limits display onscreen. The dealer, or computer, will deal five cards to each player across the table. Players can look at the hand they have and make a choice. After they’re dealt, players can choose to either add more chips to the pool to increase their bet, or fold and step out of the game. During this showdown round, players will reveal their cards to show who’s the winning player. The player with the highest possible hand is the winner and gets the entire pot. Usually, a poker hand has five cards drawn from a 52-card standard deck that’s split into a suit of four cards. Each suit has 13 different types of cards ranking from highest to lowest. In this part of the poker rules guide, we’ll be looking at which poker hands score the most to the least. Royal Flush: this hand is extremely rare. When a player gets a straight flush from ten to Ace. Straight Flush: this is a five-card hand of the same suit in numerical order. Four of a kind: any four cards with the same number. Full House: when a player’s hand has of three of the same and a pair that’s the same. Flush: five cards of the same suit in any order. Straight: five cards of any suit in numerical order. Three of a Kind: any three cards with the same number. Two Pair: a hand that has two different pairs. One Pair: any two cards with matching numbers. 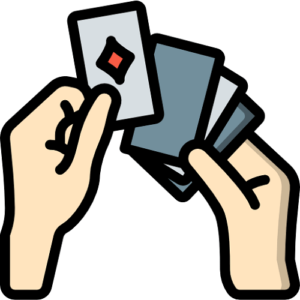 High Card: when the highest-ranking card in a player’s hand is an Ace and the lowest is a two. When playing poker online or at a land-based casino, it’s important that South African players know which variation they’re playing because each game has its own unique rules. Keep practising at home and on the free demo modes of the poker games at our top online casinos before wagering real money or joining a live dealer poker game.